Google’s manual action for Thumbtack’s unnatural links only lasted about a week and now they are back, ranking as well as ever. Last week, Thumbtack’s co-founder confirmed with Search Engine Land they had a manual action issued by Google over unnatural links pointing to their site. But less than a week later, the Google Capital funded company, has seen themselves back in Google’s good graces and ranking just as well prior to the penalty. As we covered before, what seems to have led the company into a manual action was their outreach encouraging businesses owners to add rich anchor text links to their category pages, in exchange, Thumbtack would give them progress points towards completing their online profile. After a couple days, Thumbtack emailed their businesses asking them to either remove the link or add a nofollow attribute to the link. Then a couple days after that, Google seems to have reversed the penalty. 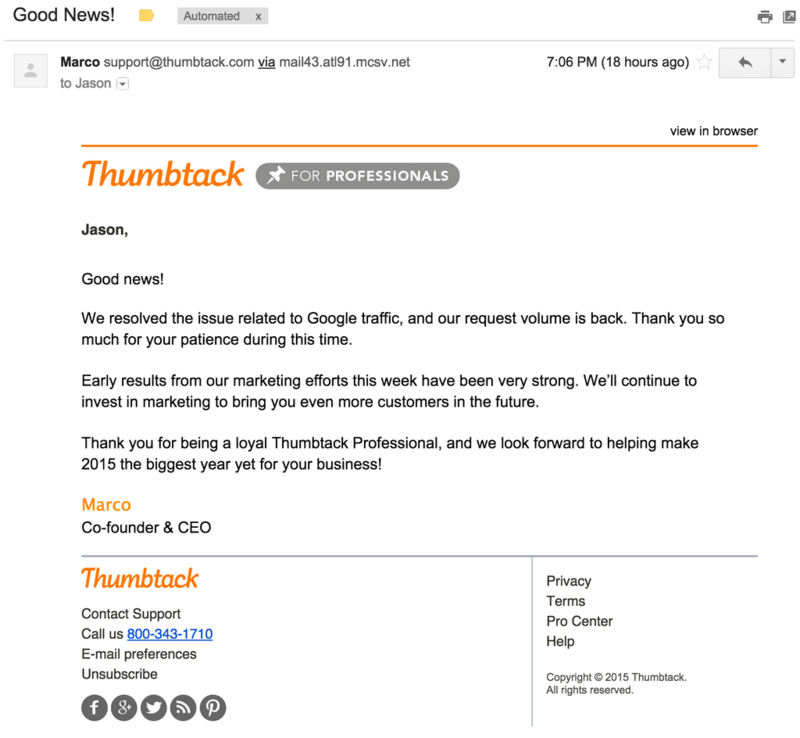 We emailed the co-founder of Thumbtack for confirmation, but he has yet to reply to our emails. However, @kikolani did receive an email from the company saying all is back to normal and the penalty has been reversed. The email said they “resolved the issue related to Google traffic,” and said their “request volume is back” to normal, which means their traffic seems to be back to normal. Razvan Gavrilas from cognitiveSEO shared tons of data showing how their traffic from Google is back to normal. All the analytics tools show the huge drop in rankings and then the massive rebound a week later. Google obviously won’t comment on manual actions but clearly the email documented above acts as the confirmation and the traffic trends show the recover. The SEO and webmaster community is asking, was it fair? Most manual actions takes months to recover and rebound from. But in this case, it took less than a week? Plus did Thumbtack have to do as much as any other non Google Capital backed company to recover from a manual action? It seems, although we don’t have proof, that all Thumbtack did was ask businesses nicely to remove or nofollow the links. They didn’t seem to disavow any links or take any additional measures to remove the bad links? If they did, you’d think all those old links wouldn’t count anymore and their rankings wouldn’t simply bounce back. But in this case, their rankings bounced back, which may imply those links are still counting. Do you think it is possible that since the company is financed by the Google Capital arm, they had been influenced to act faster internally in the Google manual action team? Or maybe it was just all the publicity around this penalty? 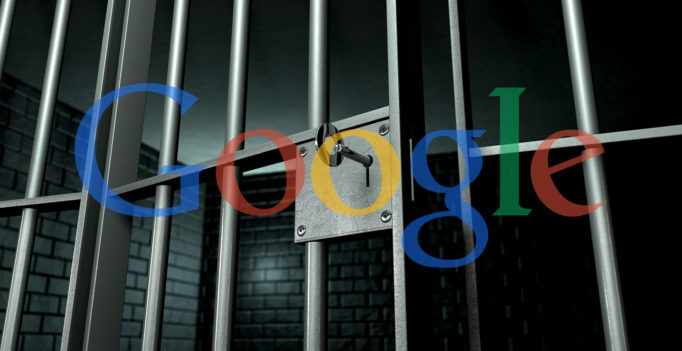 We know Google has penalized their own properties over the past years for much longer than just a week. Many well known and respected SEOs are finding all of this “shocking” and unnatural itself. Postscript: I just got off the phone with Marco Zappacosta, Co-founder & CEO of Thumbtack, who told me that the manual action was indeed revoked late last week. 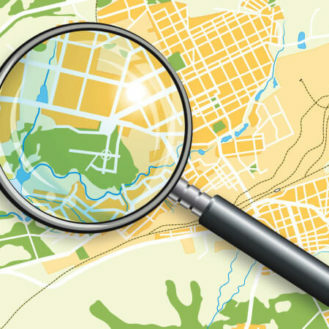 Local marketing: What is the true local web?